Manufacturer of a wide variety of fasteners, including self-drilling screws, tapping screws, thread forming screws, thread cutting screws, concrete screw, machine screws, sems, and Custom designed fasteners. And other bolts, nuts, rivets, studs, washers, Neoprene or EPDM bonded sealing washers, and metal stampings. 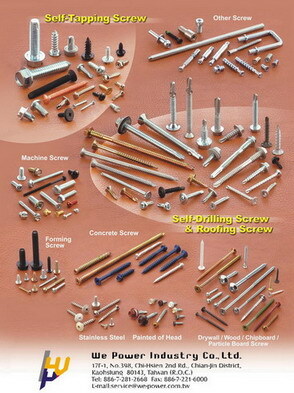 Material available in all grades of steel, stainless steel, Alloy & brass. Products are completely traceable & purchased to IFI, ANSI, ASTM, DIN, ISO & other standards.